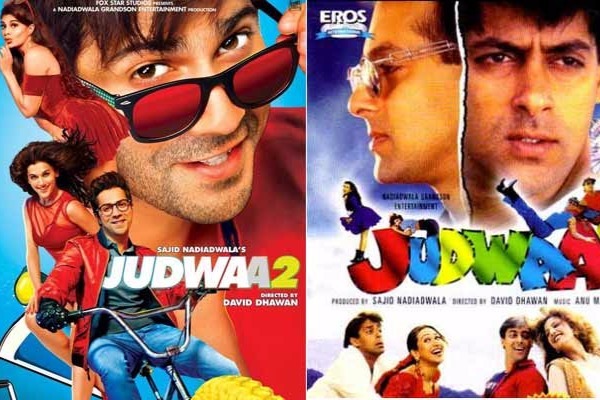 Will Varun Dhawan’s Judwaa 2 recreate Salman Khan’s magic of 90’s on-screen, again? Varun Dhawan’s Judwaa 2 trailer, which was the much-awaited event of the month, is finally out. Judwaa 2, the second installment of the hit Salman Khan starrer Judwaa that released in 1997, stars Jacqueline Fernandez and TaapseePannu alongside Varun Dhawan in the lead roles. Going by the trailer, all the three stars have managed to bring back the original flavor and it definitely looks killerrrr! The trailer offers a double mixture of action, romance, comedy and a lot of drama to make a completely entertaining film. While Varun impresses us with his amazing comedy timing as Raja and Prem, Jacqueline and Taapsee raise the hotness quotient in their hot avatar. Judwaa 2 is a story about two brothers (twins) Raja and Prem, who are born to an honest businessman. The two are then separated at birth when their father exposes a smuggling racket. The two brothers go over a sequence of events and twist of fate after they come face to face. Genetically bound by reflexes, their lives interlink in strange ways. They eventually come together to destroy the smuggling nexus and save their family from a downfall. One of the best things that the trailer showcases is that the two most popular and iconic songs from the original film have been retained. Varun, Jacqueline, and Taapsee will be seen grooving to iconic songs, ‘Oonchi Hai Building’ and ‘Tan Tana Tan’. Directed by David Dhawan, the movie is set to release on Dussehra, 29th September 2017. Is the trailer totally worth a wait? Previous : Lakme Fashion Week 2017 Day 4: The Quirkiest, Rainbow Clad Ranveer Singh Steals The Show! Next : LFW 2017 Finale: Sunny Leone, Jacqueline Fernandez, Malaika Arora Set The Ramp on Fire As Showstoppers!